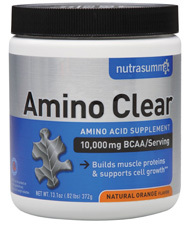 Amino Clear branched chain amino acids by NutraSumma® help you recover fast. Not only after your workout, but while you're still lifting or training - so you can pump out more reps or work out longer. Dissolves completely in water - smooth & pleasant texture! 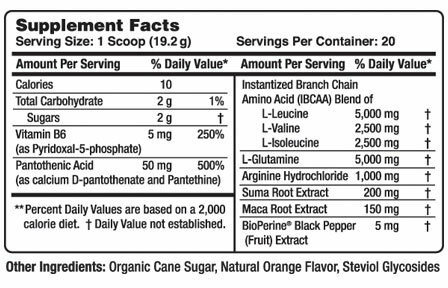 What's in NutraSumma® Amino Clear? BCAAs: BCAAs, and L-leucine specifically, helps preserve lean body mass during intense exercise. * Unfortunately, most BCAA products don't dissolve well in water, so they're unpleasantly chalky. Nutrasuma Amino Clear, however, uses only the highest quality instantized BCAAs, which dissolver faster than regular BCAAs, so they get to your muscles faster too. Absorption Enhancers: Ingredients that may improve bioavailability, such as Bioperine pepper extract. Recommended Use: Mix one scoop (19.2 g) in 4-6 fluid ounces of water or juice. May be taken at any time, although some athletes prefer to take amino acids before or immediately after a workout. Ask your healthcare provider what is right for you.